We must meet our duty, at every opportunity, to educate international visitors about how Palau has lasted in this uniquely untouched natural state for so long, and about how we can keep it this way. Oxybenzone and octinoxate leach nutrients from coral, bleach it white, and reduce its resiliency in the face of climate change. NPR writes that ‘even a small drop is enough to damage delicate corals.’ The chemicals are known endocrine disrupters, causing feminization of male fish, reproductive diseases, and embryonic deformation. Haereticus Environmental Laboratory says that oxybenzone is harmful to all mammals. An estimated 14,000 tons of sunscreen wash off swimmers’ skin and end up in coral reefs every year, so it is a lifestyle habit that needs to be seriously rethought. Fortunately there are more and more non-chemical sunscreens available that use physical blocks, such as zinc oxide and titanium dioxide, rather than chemical ones; so it’s still possible to slather up without hurting the environment as much – that is, as long as the sunscreen doesn’t come in plastic bottles! Other research has shown that plastic waste is also devastating to coral reefs, as it blocks the flow of oxygen and light to the organism, pierces its surface, and acts as a vector for disease, which infects entire colonies. So if places like Palau and Hawaii are serious about protecting their coral reefs, they should also look at mandating plastic-free packaging for natural sunscreens, and yes, these do exist. Check out Raw Elements’ metal tins, Avasol’s cardboard tubes, and Butterbean Organics’ metal tins and cardboard tubes! 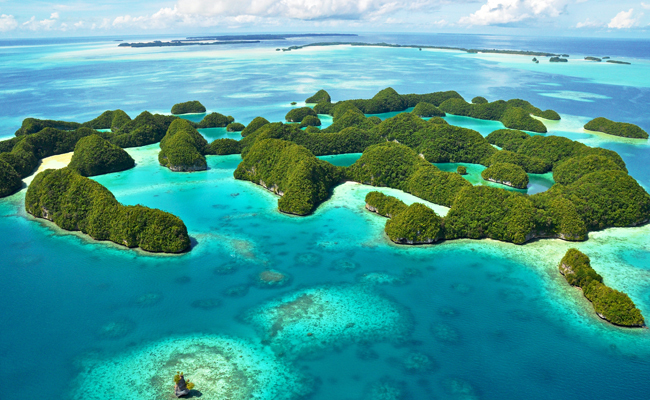 Palau’s decision is a sign of how a forward-looking government understands that environmental stewardship not only saves on cleanup costs, but also makes their nation a more desirable destination to live in and visit. Hopefully this is just the start of a global movement away from chemical sunscreens.